22nd Bn. Australian Infantry, A. I. F.
18th August 1918, aged 25. Son of Robert and Elizabeth C. Ellis, of Grovedale, Victoria, Australia. His headstone bears the inscription; "In Memory Of The Dearly Loved Son Of Mr. & Mrs. R. Ellis Of Grovedale." From Mount Duneed, Geelong, Vic. Pte Ellis enlisted on 16 July 1915 and embarked from Melbourne aboard HMAT Warilda on 8 February 1916. "He belonged to 'A' Company, we commenced the attack at Herleville on the morning of the 18th August 1918 at about 4.10.am; we were making for a point called the Crucifix. We got to the Crucifix and were forced to retire to our old position, while I was coming down a communication trench (I was bringing up the rear,) I saw Sergeant Ellis lying in the communication trench about 30 yards down from the Crucifix. He was still alive at the time (about 4.30.am,) and while Binion went for the stretcher bearers, and was absent for about two minutes, Ellis died. I was standing by him at the time. One of his legs had been badly smashed above the knee, I think he had also been hit in the body, as he was bleeding from the mouth and the nose. The lad who had gone for the stretcher bearers, Pte. A. L. Binion, 22nd Battalion had returned unable to get help and also saw that he was dead. He was buried on the battlefield where he died. He was killed by a pineapple (small minenwerfer) I saw the minenwerfer burst. I erected a cross on his grave on the 15th September. A lad, Pte. Smith, out of an English regiment (name forgotten) is buried beside him. He was the only 22nd Battalion man buried just there, the nearest was 300 yards away. I am almost sure that Pte. Smith had K.O.Y.L.I. on his cross. Ellis was known as 'Donger' and he was about the most popular lad in the company." Both Sergeant Nash and Private Binion survived the war, also buried within this cemetery is 62418 Private G. E. Smith, 2nd Bn. King's Own Yorkshire Light Infantry, killed in action, 19th August 1918 and buried in Plot V. F. 10. He is almost certainly the man who was buried on the battlefield next to Leslie Ellis. Arthur Ernest Fergusson, M. M.
2nd Bn. Australian Infantry, A. I. F.
23rd August 1918, aged 22. Son of James Stevens Fergusson and Mary Jane Fergusson, of 54, Rowntree St., Balmain, New South Wales. ​His headstone bears the inscription; "Dearly Loved Son Of J. S. And M. J. Fergusson Of Balmain, Sydney, N. S. W."
Arthur was born in 1896 at Balmain, Sydney, he died at St. Martin's Wood near Proyart, France 23rd August 1918. The above picture on the left was taken in Sydney before leaving for the war and the picture on the right was taken in London in 1917 when Arthur was on leave. Picture courtesy of Colin Butcher, Arthur was his Grandfather's brother and his loss was felt all of his life. ​12th Bn. Australian Infantry, A. I. F.
23rd August 1918, aged 28. ​Son of Henry and Blanche Laura Foster, of Merton Vale, Campbell Town, Tasmania. ​His headstone bears the inscription. "For God, King and Country." 9th August 1918, aged 34. Son of Thomas and Caroline Garlick, of Yarloop, Western Australia. Born at Monea, Victoria, Australia. ​His headstone bears the inscription; "His Duty Nobly Done." A timber worker from Yarloop, Western Australia, prior to enlistment, he embarked for Suez from Adelaide on 18 November 1915 aboard HMAT Geelong. On 15 March 1916 he transferred to the 5th Divisional Artillery with the rank of Gunner and was taken on strength of the 14th Field Artillery Brigade which relocated to the Western Front, France, in late June 1916. He was wounded in action in a gas attack in July 1917. In January 1918 he was promoted to Bombardier in January 1918 and to Temporary Corporal on 14 July 1918. Cpl Garlick was killed in action near Morcourt, France, on 9 August 1918 and is buried in the Heath Cemetery, Harbonnieres. He was aged 34 years. His younger brother 2600 Pte John Garlick, 5th Pioneer Battalion, was killed in action near Bapaume, France, on 23 May 1917. He was aged 29 years and is commemorated on the Villers-Bretonneux Memorial. 23rd August 1918, aged 27. Son of John and Eleanor Sherwin Gillanders. Born at Warrnambool, Victoria, Australia. His headstone bears the inscription; "Duty Nobly Done." A 22 year old butcher prior to enlisting in the AIF on 1 November 1915, he embarked for overseas with the 22nd Reinforcements from Melbourne on 25 October 1916 aboard HMAT Ulysses. He was wounded in action near Zillebeke, Belgium on 20 September 1917 and evacuated to England for medical treatment. After rejoining his unit in France on 21 April 1918, he was killed in action at Foucaucourt. 7th Bn. Australian Infantry, A. I. F.
9th August 1918, aged 24. Son of William and Elizabeth Haslem, of 10, Doon St., Prahran, Victoria, Australia. Born at Chiltern, Victoria. His headstone bears the inscription; "Their Glory Shall Not Be Blotted Out." A labourer from Chiltern, Victoria prior to enlistment, Pte Haslem embarked with the 8th Reinforcements from Melbourne on HMAT Anchises on 26 August 1915. Later promoted to Lance Corporal, he was killed in action on 9 August 1918, aged 24. Charles Henry Hatt. M. M.
17th August 1918, aged 25. Son of Thomas and Elizabeth Hatt, of The Lodge, Furzfield, Eastwood Road, Leigh-on-Sea, England. Born at Chelsea, London, England. His headstone bears the inscription; "In Proud And Dearest Memory From Mother, Dad And Bob." Killed in action near Harbonnieres. "He was in charge of the intelligence section of the 23rd Battalion, formerly gassed at Warneton, he had only returned from 'Blighty' 4 days when he was sent forward with intelligence officer Lt. Weir to observe from a newly taken point. Huns returned, Lt. Weir wounded and died of wounds. Hatt received bullet wounds in the head and was killed outright. Pioneer Sergeant Schultz, who went up to bury him, found he had been stripped by the huns. He was buried at the scene near the cross roads in the locality of Villers-Bretonneux. In accordance with battalion instruction, a cross was made and sent up for erection, but on re-visiting the locality we found the surrounding ground had been blown out." 29th Bn. australian Infantry, A. I. F.
9th August 1918, aged 25. Son of David Walker Herd and Lavinia Elizabeth Herd, of Esk St., Lithgow, New South Wales. Born at South Melbourne, Victoria. His headstone bears the inscription; "Oh Son & Brother Dear Well Hast Thou Played Thy Part Afar In France." A railway employee from Kurumburra, Victoria prior to enlistment, Pte Herd embarked with A Company from Melbourne on HMAT Ascanius on 10 November 1915. While serving in France he was wounded in action on two separate occasions but remained on duty. On 9 August 1918, aged 25, he was killed in action near Harbonnieres, France. ​17th August 1918, aged 28. Son of Joseph Herbert and Hephzibah Hirst; husband of Nellie Hirst, of 334, Albert Rd., Albert Park, Victoria, Australia. Born at Richmond, Victoria. His headstone bears the inscription; "In Memory Of A Dearly Loved Husband And Father; One Of The Best." A 27 year old clerk from South Melbourne, Victoria when he enlisted and embarked for overseas with the 19th Reinforcements from Melbourne on 11 May 1917 aboard HMAT Ascanius. 5th Bn. Australian Infantry, A. I. F.
Son of W. F. and Isabel Honeychurch, of Bright, Victoria, Australia. Born at Wandiligong, Victoria. His headstone bears the inscription; "He Gave His Life For Those He Loved Most Dear." 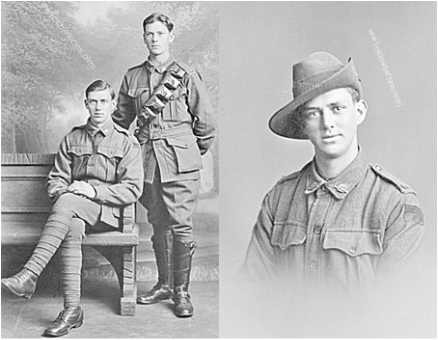 Hector George Honeychurch, 5th Battalion AIF (sitting) and his brother 4117 Driver (Dvr) William Honeychurch, 3rd Divisional Ammunition Column (3DAC). Hector Honeychurch, a driver from Wandiligong near Bright in Victoria was killed in action near Harbonnieres, France on 23 August 1918. He was 22. 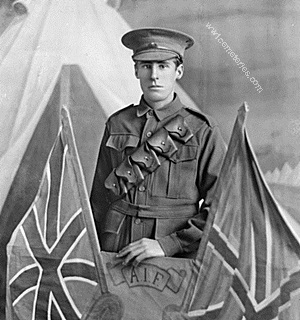 William survived the war although a third brother 206 Pte Henry Honeychurch, 14th Battalion AIF, was killed in action at Gallipoli on 27 April 1915 aged 21. He is buried in Courtney's and Steel's Post Cemetery. 41st Bn. Australian Infantry, A. I. F.
8th August 1918, aged 25. Son of Herbert Henry Houghton and of Sarah Ann Payne, of Prince St., Paddington, Queensland. Native of North Pine. His headstone bears the inscription; "In Memory Of Our Brave Son & Brother; Peace Perfect Peace." A labourer prior to enlisting on 8 January 1916, Pte Houghton embarked from Brisbane, Qld, aboard HMAT Clan McGillivray on 1 May 1916. Son of James Turner Irons and Charlotte Irons, of Mercer St., Geelong, Victoria, Australia. Born at Diapur, Victoria. His headstone bears the inscription; "His Young Life Went Out As The Glory Of A Setting Star." A 26 year old clerk from Diapur, Victoria when he enlisted in the AIF on 12 May 1916. He embarked for overseas with the 20th Reinforcements from Melbourne on 11 September 1916 aboard HMAT Euripieds.